Subic Bay container terminal. Source: Subic Bay International Terminal Corp. The Subic Bay Metropolitan Authority (SBMA) promotes the Port of Subic to become Philippines’ major container facility, informs Subic Bay International Terminal Corporation, the operator of Subic container port and an affiliate of Philippines-based global port operator ICTSI. On this move, the SBMA has initiated a #GoSubicBay open window access for container port-related businesses and will grant a free accreditation, waiving the USD 200 accreditation fee up to 31 December 2017. The initiative was announced at the 43rd Philippine Business Conference and Expo at The Manila Hotel in Manila City last week by SBMA Chairman and Administrator Wilma T. Eisma. The objective of this incentive program is to showcase and broaden industry awareness of the use of the Port of Subic Bay’s Container Terminal, increase its container volumes and utilization rate, and to help decongest the Port of Manila. 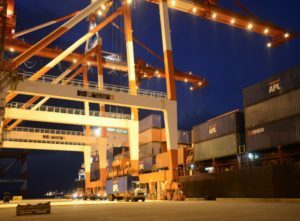 “Subic Freeport has a faster turnaround time, reduced processing time, there’s no red tape, no congestion, no traffic and no truck ban,” said Wilma Eisma, highlighting also a lower tariff, vessels docking upon arrival and a higher efficiency. SBMA Seaport Promotions Manager Ronnie Yambao explained that the SBMA will waive the USD 200 accreditation fee for the first 80 new business entrants and the first 20 accredited entities due for renewal of accreditation certificate. The incentive program covers ship agents, freight forwarders, brokerage firms and trucking services related to container movement. “These entities will be entitled to free-of-charge accreditation if they guarantee to bring in at least one container within one month from filing of application or renewal of accreditation certificate,” Ronnie Yambao said. Yambao stressed, however, that failure by applicants to guarantee the entry of at least one container would cause the Port of Subic to require the payment of the USD 200 accreditation fee.